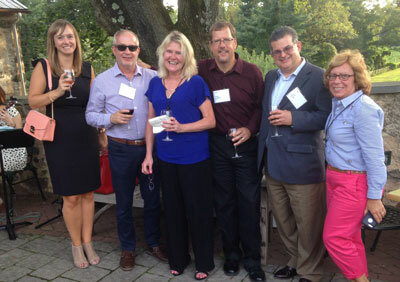 From left: Rachel Goc, KPMG; Rich Piechowski, IKEA; Kate Shaughnessy, Vertex; Greg LeBlanc, QVC; Dave Antoni, KPMG; and Joanne Tempone, TEI. TEI’s Philadelphia Chapter recently held its annual wine tasting and KPMG continuing education event at Grace Winery in Glen Mills, Pennsylvania. KPMG opened the event with an excellent, informative CPE program on the federal tax reform initiative underway in Washington, D.C., and financial reporting. After the CPE program, members adjourned to the Grace Winery terrace to taste some of the winery’s vintage varietals. The event has become a highlight of the Philadelphia Chapter’s year.